Have acne? You are not alone, and it can be treated. 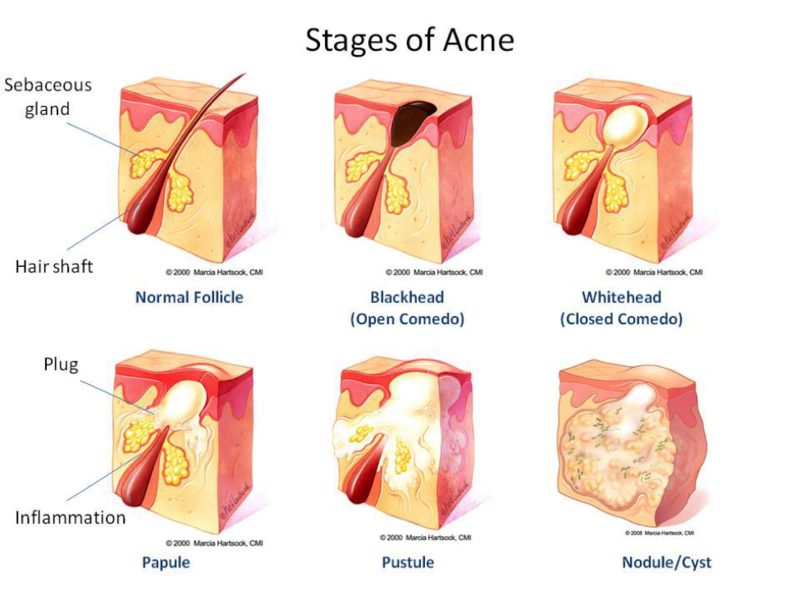 Acne vulgaris (acne) affects between 85-95% of teenagers and is the most common skin condition in the United States. It typically has an onset between ages 8-12 yrs of age, peaks at 15-18 years and resolves in most by 25 years of age. For some, acne can persist. Approximately 10-15% of adult females and 3% of adult males continue to suffer from acne. 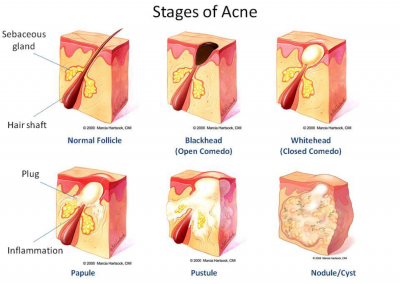 Acne can be both physically and emotionally painful. Long term effects of acne can lead to permanent scarring and low self-esteem if not treated. At Front Range Dermatology Associates we have a highly trained staff who can come up with an individualized treatment plan for you, if you are one of many who have acne. Give us a call today. 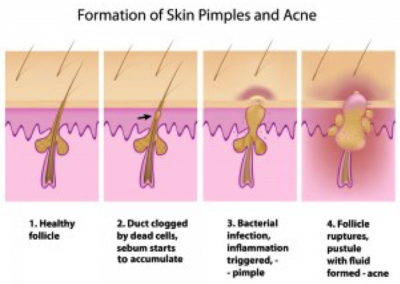 Acne is a disorder that involves the hair follicles and sebaceous glands (oil glands). It can occur anywhere on the body where there is hair, but most commonly affects the face, chest, and back. 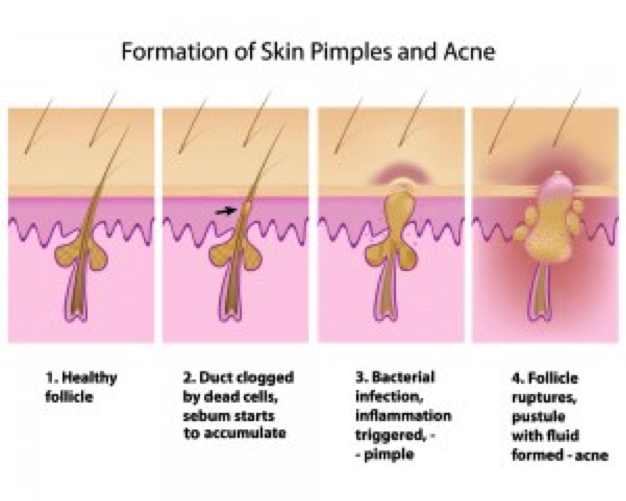 Acne starts when the follicular pore clogs with dead skin cells into what is known as a comedone. The skin also has sebaceous glands that empty through the pore. If the pore is plugged, the oil can build up in the pore. 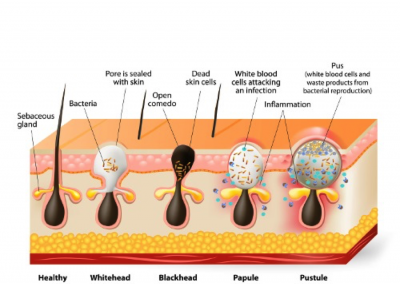 There is bacteria that lives on your skin call Propionibacterium acnes, which breaks down the oil in the pore. When the bacteria multiples it leads to inflammation and causes redness, swelling and pain. Hormones control the amount of oil production. 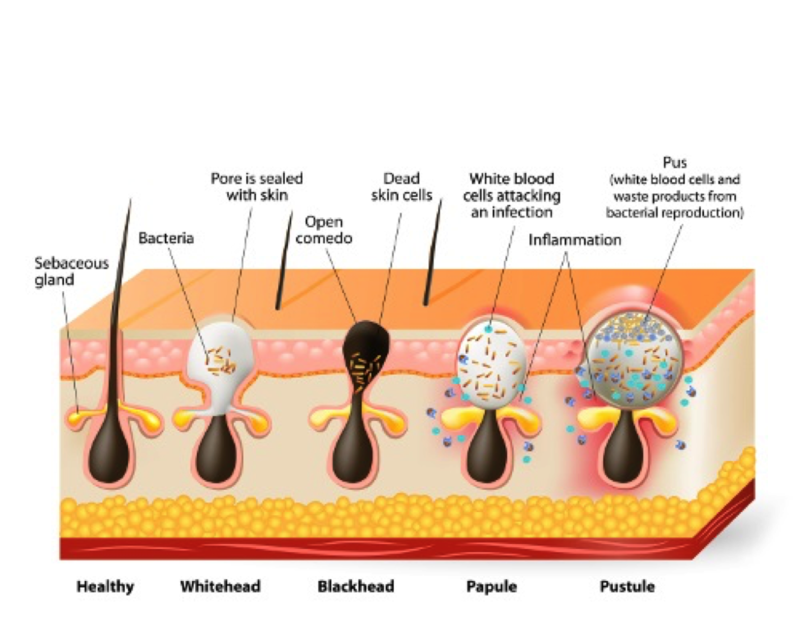 Comedonal acne – consists of white heads and black heads without inflammation. Inflammatory acne – consists of papules, pustules, or nodules/cysts. While most patient’s acne will resolve with time, waiting for acne to clear on its own can be frustrating. Even mild acne can lead to scarring in 20% of patients, and its effect on appearance can lead to low self-esteem, anxiety, and depression. The dermatology experts at Front Range Dermatology Associates can develop a treatment program to help your skin feel and look better. Treatments may include one or more of the following. Topical medications (tretinoin, adapalene, tazarotene, azelaic acid, benzoyl peroxide, sulfur/sulfacetamide, clindamycin, dapsone). Oral medication (minocycline, doxycycline, sulfamethoxazole/trimethoprim, azithromycin, spironolactone, oral birth controls, isotretinoin). If you are ready to feel proud of the skin you live in, contact Front Range Dermatology Associates’ award-winning team by submitting the form below.